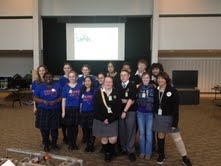 On Feb 21st the team visited our sponsor Lockheed Martin of Valley Forge for Engineering Week activities. 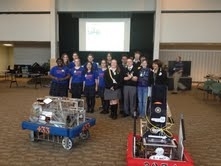 We were accompanied by team 433, the Firebirds from Mount Saint Joseph Academy. At the event, the team was privileged to hear from a panel of Lockheed engineers and IT professionals about what it is like to be part of team working on the cutting edge of technology. We found out that our FIRST robotics build experience is very much like the real world of engineering and design. This event was held on the last day of build season and were able to bring our just completed 2012 robot (Shark Byte) and demo it to Lockheed employees. They were very impressed and came away with a very favorable impression of FIRST FRC. We spoke with employees with connections with FIRST from Jr FFL thru FRC.